Carl Weathers displays his winning charm in yet another title role. Weathers IS Detroit cop Jericho "Action" Jackson - and you know with a nickname like that he doesn’t mess around. Evil, megalomaniacal auto magnate Peter Dellaplane (Nelson) is killing off AWA (Auto Workers Alliance) members in order to keep a stranglehold on his already-impressive power. Dellaplane and Jackson have a past, as Jackson was demoted after roughing up his son before sending him to prison. Ignoring the fact that his wife is Sharon Stone in her prime years of hotness, Dellaplane also has a chick on the side, Sydney (Vanity), who he keeps drugged up with heroin. Sydney and Jackson now must team up to take down Dellaplane before he can frame Jackson for his many murders. Ah, the golden 80’s. Just take a second to pause and reflect about that magical decade. 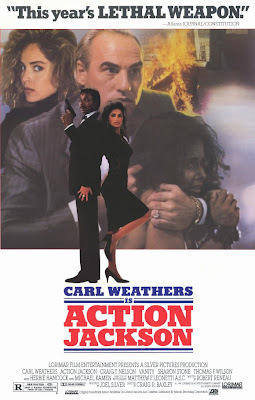 Back to the review at hand, Action Jackson is classic 80’s action, reminiscent of Arnold vehicles such as Raw Deal (1986). It’s well-shot, and unusually well-written, with plenty of clever jokes and dialogue. But the film also has all the action the underground action movies have, but this came out in a time when things like this came to the theater and had a moderate-to-big budget behind them. Besides the aforementioned Sharon Stone and Vanity, Weathers has an impressive cast to back him up: Bill Duke as the classic BYC (Black Yelling Chief), Thomas F. Wilson (Biff of Back to the Future, 1985 fame) as the joke-telling uniformed officer, Bob Minor as the evil assassin Gamble, Nicholas Worth as Dellaplane’s butler, Al Leong as Dellaplane’s chauffeur, James Lew as Dellaplane’s martial arts instructor, Charles Meshack of Fear (1988) fame, Sonny Landham and the ubiquitous Branscombe Richmond. It even has fan favorite Robert Davi in a small but important role. Last but not least is the “Coach” himself, Craig T. Nelson, looking more diabolical than usual, probably because of the hair. We even get to see him do some “Craig-Fu” - but does he really think he can beat Action Jackson in a fight? The movie is funny, snappy and a great vehicle for Weathers’ charisma. But what else would you expect from director Baxley, the man behind Stone Cold (1991) and I Come In Peace (1990), among many others? It’s a product of a great time for cinema - and it’s also filled with great music, especially the title song by Madame X which you’ll be singing for days. It’s pretty tough to dislike this highly entertaining gem. Love Action Jackson, need to re-watch, it's sp long since I saw it last. Nice review! I remember watching this back in the day countless times. Great movie, have to watch it again sometime soon. Good to see you get to this one Ty, it's a corker! A hero never dies: Thanks! It still holds up as a 80s classic! Kult Eye Bleeder: It is such a great movie! Carl Weathers at his best. Sutekh: It is a total blast! One of the best parts is when "Action Jackson" jumped over a car. You need to add Al Leong to The Hall of Hero's. Will do! Thanks for the suggestion! When I was a kid I was kind of intimidated by Carl Weathers. I think he should have been James Trivette on Walker, Texas Ranger. They probably didn't cast Weathers because his personality would outshine Chuck's. Love this flick, tons of fun, especially with Carl Weathers. Great stuff. Totally agree! Carl Weathers was awesome in this. How do you like your ribs? Action Jackson style baby! Poor Carl....never really did to much besides Apollo and Dillon ....nice to see him get his own vehicle for once. A guilty pleasure greatly enjoyed for fans of 80's action. Definitely agree with you! Carl Weathers was super cool in this. One of his best roles. i'm tellin' ya man! they shoulda made more of these! i'll never understand why this wasn't a hit. it's got everything you could possibly want in an 80's action flick. damn studios! I know! 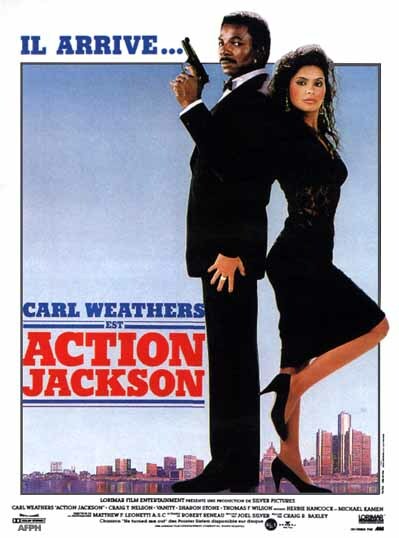 Action Jackson is one the best 80s action movies. This could have been a great franchise. Just watched this again last weekend. Cracking movie - could have watched 4 or 5 of these. Weathers was pretty good at the one liners - "Excuse me, I gotta catch a cab." But yeah what the hell was Craig T Nelson doing, I nearly spat out my coffee watching him pull out those kung fu moves! It is definitely a blast! Carl Weathers at his best. Craig T. Nelson should have do his awesome karate moves on Coach! Haha. Haha! It basically looks the same. That is cool you noticed that.